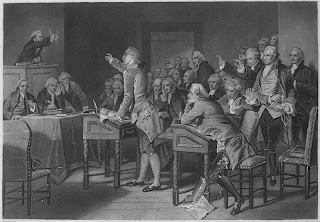 When Patrick Henry gave this his most famous speech on March 23, 1775, * he was still grief-stricken because his beloved wife Sarah Henry had died the month before. Sarah and Patrick were childhood sweethearts. They married when Patrick was eighteen and Sarah was sixteen. It was this connection that would bring Patrick the most joy and most sorrow in his life. The tragedy that surrounded Sarah’s last few years has resulted in a haunting that has lasted over two centuries. When Patrick married he was already a “failed merchant,” but Sarah’s dowry included a 600-acre farm, a house, and six slaves. So the two young newlyweds became planters. But in three years a fire destroyed Henry’s plantation. Patrick again became a merchant, but for a second time, he failed as a businessman. Just months after the Henrys moved in Sarah gave birth to their sixth child, a son. Shortly after this, she started to exhibit signs of mental illness, her condition worsened steadily and resulted in her death in 1775 just four years later. Few records of Sarah’s condition survived, but some believe she suffered from “puerperal psychosis.” Which is a mental illness that often occurs after childbirth. It was during this time that Patrick had to make a difficult decision. He viewed a public hospital in Williamsburg and was so horrified at what he saw he decided to keep his wife at Scotchtown where he could make sure Sarah received the attention she needed. In the last year of her life, Sarah’s condition worsened to the point where the family decided to keep her confined in two of the basement rooms at Scotchtown. It is said during this period she exhibited a “strange antipathy” toward her family. A servant was first assigned to monitor her behavior but when she started to inflict bodily harm upon herself a special “straight-dress” similar to today’s straightjacket was used to restrain her. Patrick remained loyal to his wife to the end. He made attempts to keep his wife’s condition secret. He even used a secret stairway in the back hall of Scotchtown when visiting his wife in the basement. This is probably the main reason Patrick tried to keep Sarah’s illness secret. But as word spread across the plantation many servants, slaves, and workers refused to come near the mansion let alone enter it. When Sarah died in February of 1775, she was buried in an unmarked grave on the plantation. It was a custom at the time to bury people with mental illness in secret. This again was connected to the belief that the mentally ill where possessed by demons. To this day the location of Sarah’s final resting place is not known. In 1777 when Patrick Henry was elected the first governor *** of Virginia he sold Scotchtown because it held too many bad memories for him. But it seems Sarah’s ghost remained. A lot of strange things have occurred at Scotchtown over the years. The house itself for many years was abandoned and allowed to slowly deteriorate. During this time many neighbors saw lights at the windows, which looked like candlelight. A female ghost was seen by a group of children and adults wearing a long flowing white dress floating along the back of the house. This same spirit was seen making its way from the basement of the house to one of the outer buildings that housed the servants. Patrick Henry’s great-great-great granddaughter felt the house was haunted and would not stay overnight. Mary Adams as a child lived at Scotchtown from 1933 to 1940 she heard unusual noises frequently. She and a group of her young friends saw a woman in a long, white gown inside the house, the figure disappeared in front of them. She and others heard chains being dragged across the attic floor. In 1958 the Association for the Preservation of Virginia Antiquities purchased and restored Scotchtown. Since a cradle used by the Henrys that is kept on the first floor has moved on its own. A tea caddy and the top of a teapot were moved while the house was empty. A candle that dates from the Henrys time in the home was moved during the night when the house was closed. The door to the basement is never locked, but sometimes it will not open. Witnesses state it is like someone is holding it on the other side. In recent times more strange activity has been witnessed. On Halloween night in 1990, a policeman took a report from a neighbor who witnessed candlelight in the window after the mansion had been closed for the day. This female witness reported that as she entered the grounds, the candlelight disappeared but that she then saw a transparent figure of a woman walk past one window holding a candle. The police are often called to the estate because the alarm system and motion detectors are set off without explanation. During tours of the house, visitors have also experienced strange activity. One docent took her group into the room directly above the basement rooms where Sarah was confined. As she told the visitors about Sarah’s last tragic years, they all heard a loud shrill scream coming from the rooms below. The group scattered quickly. Visitors have also reported feeling as if someone is watching them or standing behind them while they are in the basement. A portrait of Joseph Shelton, Shelton was Sarah’s maiden name, hangs at Scotchtown. Many people have reported that the eyes of this man seem to follow them while they are in the room. In the attic, strange swarms of wasps and flies have collected at one window. Another odd phenomenon at Scotchtown is connected to the two basement rooms were Sarah died. Ever since the mansion was renovated there have been attempts made to paint the walls in this area. Professional painters have been hired, top quality paint has been used, but regardless the color will not adhere to the walls. It is stated the paint literally “burns” off the walls, and there is no scientific reason for why this occurs. So even today the walls in these two rooms are dreary and in need of fresh paint. * Patrick Henry’s speech helped move America toward American independence. ** Scotchtown was initially built in 1719 and is a one-story house that is 80 feet long and 40 feet wide. It has eight rooms on the main floor and eight rooms in the basement. It also has a large attic. *** Patrick Henry served 5 terms as governor of Virginia. He remarried in 1776 to Dorothea Dandridge. Between his two marriages, he had seventeen children. Large families were ordinary because many children died of illness. Six of Patrick Henry’s children died before him.